← The Great Fair Returns to The Hills! The Winter Thaw Continues at Sonoran Lifestyle Real Estate! A Chance for Snowbirds to Mix & Mingle! The sun is shining in our part of the world and our winter visitors are enjoying the warmth of Arizona. To celebrate the coming together of fabulous weather and our wonderful winter visitors, Sonoran Lifestyle Real Estate will be hosting events for a chance to mingle! We hope you join us as we meet new people and enjoy all that Fountain Hills has to offer. Fountain Hills has a wealth of artistic treasures. 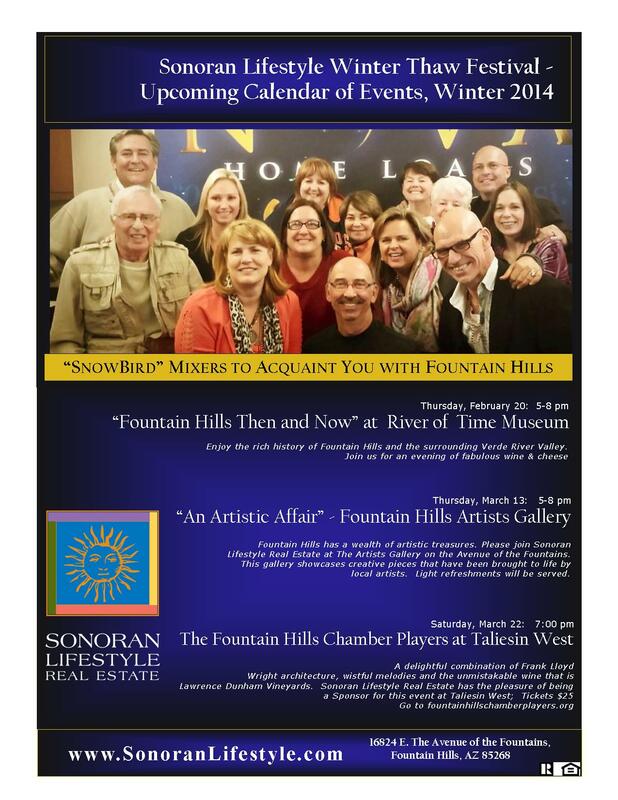 Please join Sonoran Lifestyle Real Estate at the Artists Gallery on the Avenue of the Fountains. This gallery showcases creative pieces that have been brought to life by local artists. Light refreshments will be served. This entry was posted in Area Events, Arts, Culture, Schools & Clubs, Businesses We Love, Clients, Customers, Friends & Family, Dining, Libations & All Things Foodie and tagged Artists Gallery Fountain Hills, River of Time Museum, SOnoroan Lifestyle Real Estate, Winter Thaw. Bookmark the permalink.